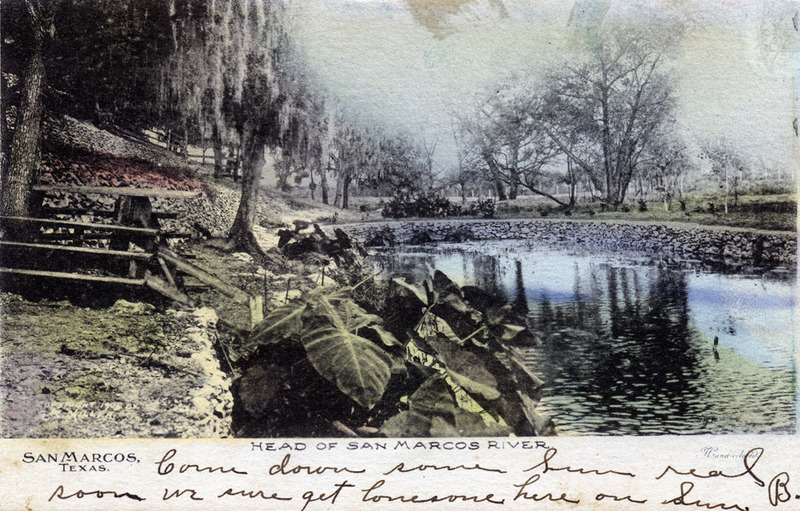 The springs of the San Marcos River in central Texas have plenty of extraordinary traits: Each day, they release about 100 million gallons of water, forming the life source for one of the longest-inhabited places in North America. They’re also the primary habitat for several endangered species, including a blind salamander found nowhere else on earth. 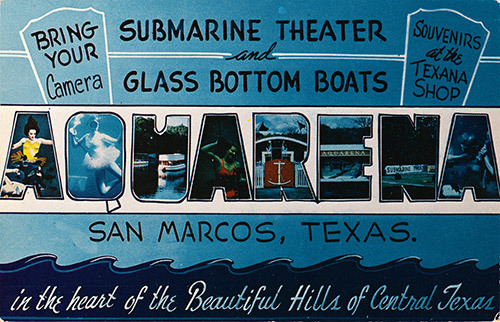 Yet the most magical thing about the San Marcos springs is actually no longer there—its unique submersible theater, or “Aquarena,” which once gave audiences a window into an underwater world of mermaids, clowns, and a swimming pig named Ralph. 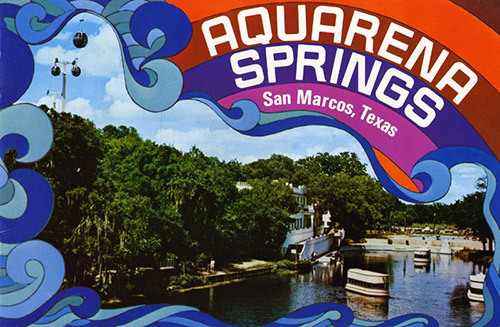 My great-aunt, Sue Cregg, was a performer at Aquarena Springs in the 1960s, and its mermaid theater was a major highlight of my childhood in nearby Austin, Texas. As a kid, I was fascinated by the mermaids and their secret language of aquatic gestures, which I attempted to master on every trip to the public pool. Family lore has it that I once watched seven mermaid shows in a row. But long before this mid-century spectacle was developed, the cold waters of Spring Lake had been a destination in their own right, thanks to their endless supply of fresh water. During the fight over Texas between Mexico and the United States, the land changed hands many times, but was finally purchased by General Edward Burleson in 1845. Burleson, who briefly served as the vice president of the Republic of Texas, dammed the headwaters to run a grist mill and built a two-room cabin overlooking the newly created Spring Lake. The resulting lake inadvertently preserved thousands of artifacts from earlier settlements along the banks, items that wouldn’t be found until an underwater dig began in 1978. These archaeological discoveries suggested that various groups had lived alongside the springs for over 12,000 years. This colored postcard shows an early view of Spring Lake before Rogers purchased the plot. Image via edwardsaquifer.net. The site’s tourist destination began to take shape in 1924, when A. B. Rogers bought Burleson’s homestead plot, including his ramshackle log cabin. Rogers constructed a small resort hotel on the lake, and in 1946, added glass-bottom boats to the attraction, which allowed riders to see through the clear waters down to the bubbling springs and aquatic ecosystem some 30 feet below. 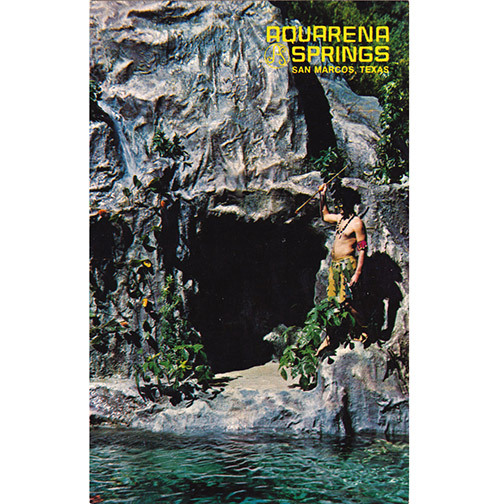 Mermaids arrived at Spring Lake via Rogers’s son Paul, who founded Aquarena Springs in 1949, modeling its underwater amusements on the popular Weeki Wachee Springs resort in Florida. 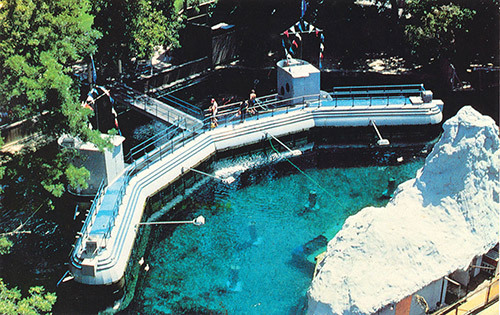 Weeki Wachee had opened two years earlier, pioneering the underwater theater with its air hose apparatus that allowed performers to stay submerged without heavy gear. Left, the boat docks and Spring Lake hotel, circa 1930s, and right, a view inside a glass-bottom boat. 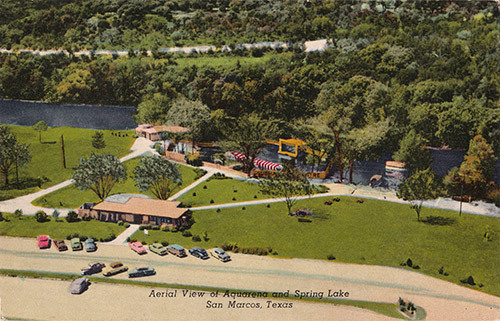 In San Marcos, Paul dredged a portion of the lake and installed a custom-built submarine theater in 1950. 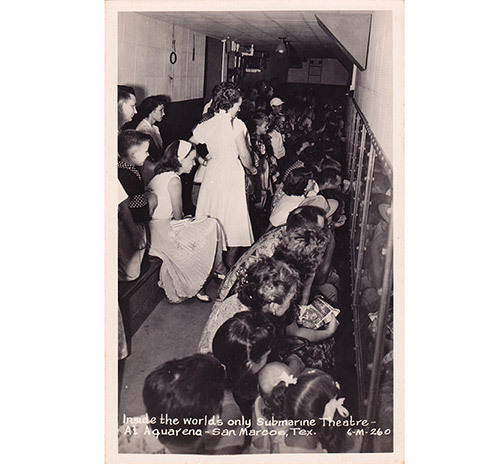 The steel auditorium featured one wall of thick glass windows, positioned above water when the audience entered, and slowly descended once everyone was seated, providing a clear view of the underwater stage. Paul also brought Don and Margaret Russell onboard to help launch his underwater theme park. Don had managed Weeki Wachee, and his wife, Margaret, was one of the attraction’s first mermaids. Margaret’s impressive swimming skills had scored her a stunt-double role for movie star Ann Blyth during the filming of “Mr. Peabody and the Mermaid” in 1948. 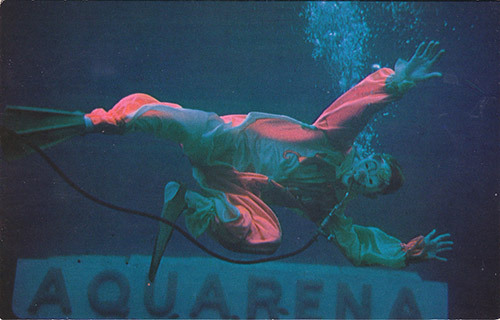 At Aquarena, Don assisted with business development while Margaret became the lead trainer and choreographer for the theater’s underwater shows. 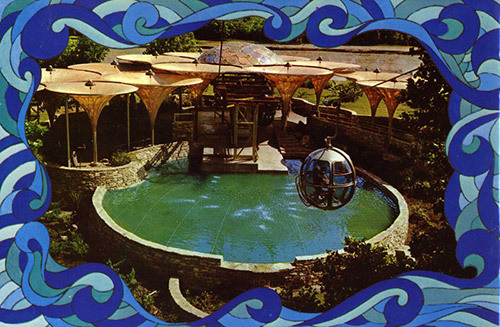 Eventually, Paul would add other features to make Aquarena one of the most-visited theme parks in Texas, including a Swiss-style gondola ride over the lake, a “Sky Spiral” or panoramic viewing room that rose to the top of a needle-shaped tower, and a kitschy, western-themed “Texana Village.” At one point, the park was even home to a basketball-playing chicken and another that would beat you at a game of tic-tac-toe. But like the fabled sirens, it was the mermaids that really drew people to Spring Lake. Peggy Sparks holds a photo of herself taken when she worked at Aquarena. Image by Andy Sharp for the Austin American Statesman. 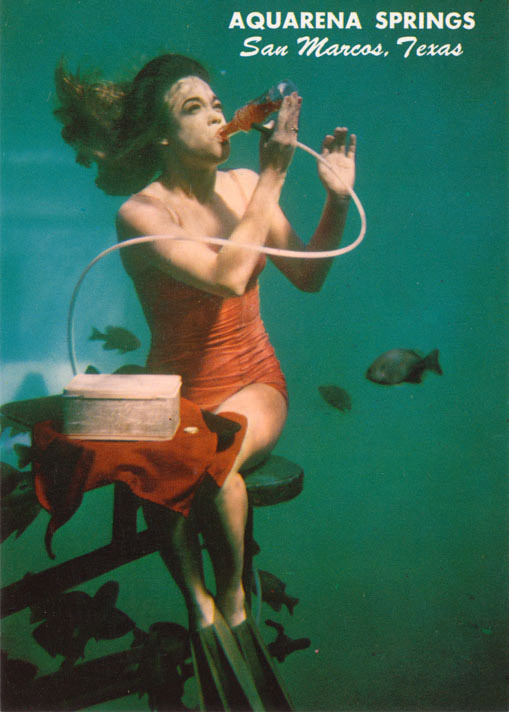 Peggy Sparks was one of the first underwater performers at Aquarena Springs, starting in the summer of 1950 when she was just 20 years old. 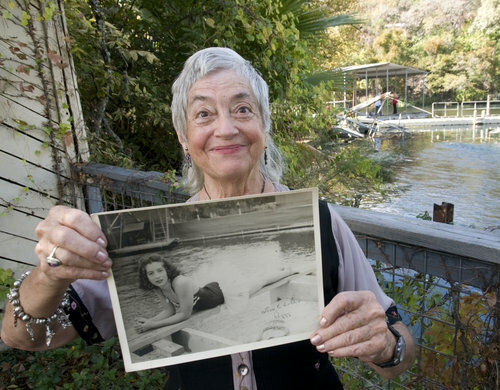 Sparks had discovered Aquarena while living in Austin: At the time, her next-door neighbor was the artist and naturalist Zarh Pritchard, sometimes called “The Merman” because of his famous oil paintings executed during extended dive sessions. 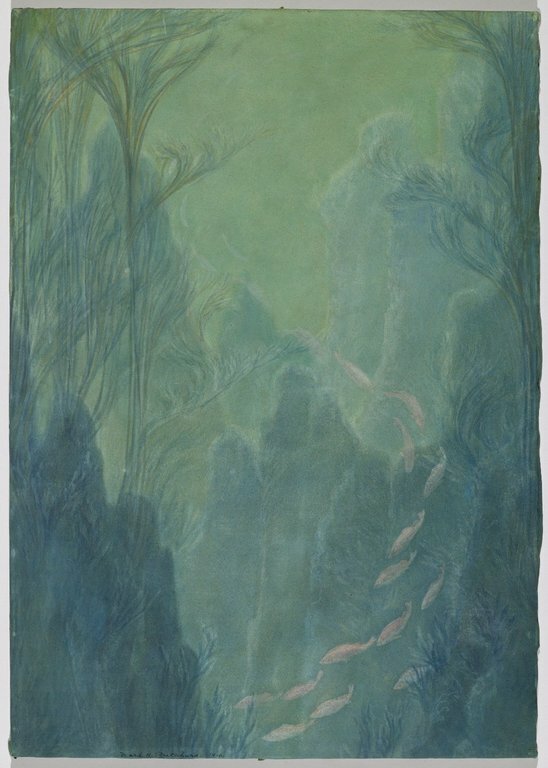 Pritchard wrote of the mysterious oceanic environment, “On reaching bottom, it is as if one were temporarily resting on a dissolving fragment of some far planet.” He captured these ethereal underwater vistas while on the seafloor using a specially prepared easel, canvas, and palette. “Bream in 25 Feet of Water Off the West Coast of Scotland,” by Zarh Pritchard circa 1910. Image via the Brooklyn Museum. Already a strong swimmer, Sparks was enchanted by Pritchard’s oceanscapes, which opened her eyes to the possibility of spending longer stretches of time underwater. “When we’re born, we’re used to being underwater from the womb, so I guess a little switchover doesn’t make much difference,” says Sparks. A view of the first Aquarena set, which also included an underwater stage and air-filled green room. Image via edwardsaquifer.net. 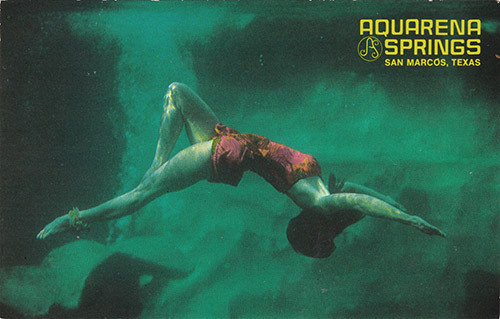 Like many generations of aquamaids after her, Sparks trained with Margaret Russell, the show’s original director and choreographer, who taught the swimmers dance moves and special tricks, like eating or drinking while submerged. Before a show, actors would first dive down into a backstage area, an underwater green room filled with air. From there, they could communicate with the theater announcer and time their entrances. “Two of us would come out and position ourselves even with each other, and then take a breath of air, a light one,” explains Sparks. “You didn’t get your lungs too full because then you’d come to the top, so you just take a sip.” Even without taking a full breath, Aquarena’s mermaids often performed 10 or more moves before getting fresh air from the hose. 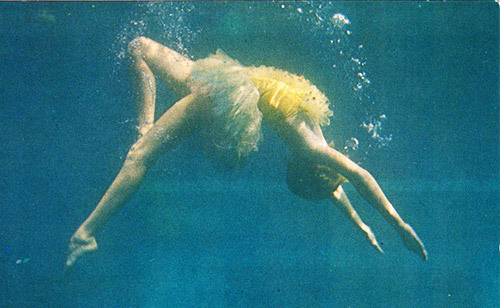 A full performance typically included an underwater picnic, a few clown stunts, and an elegant underwater ballet. 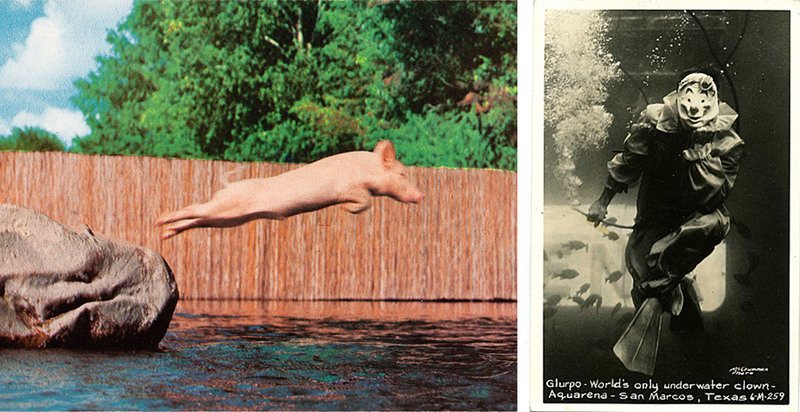 Left, Ralph captured mid-“swine dive.” Right, an early shot of Aquarena’s clown, Glurpo. “Before we sat down on the picnic perches, we fed the fish frozen dog food,” says Cregg. “When we weren’t in a show, part of our job was to make balls of frozen dog food. Our meal for the picnic was celery with the strings stripped out of it so we wouldn’t choke, sprinkled with this gravel-type stuff. We’d sprinkle that from a shaker like it was salt. We also bottled our own Kool-Aid in Coke bottles. In order to drink underwater, you have to blow into the bottle to force the liquid into your mouth. And we had napkins to put in our laps; it was very elegant.” During Cregg’s time, the aquamaids also had to decorate their own swimsuits, sewing on rhinestones and sequins to resemble glittering scales. 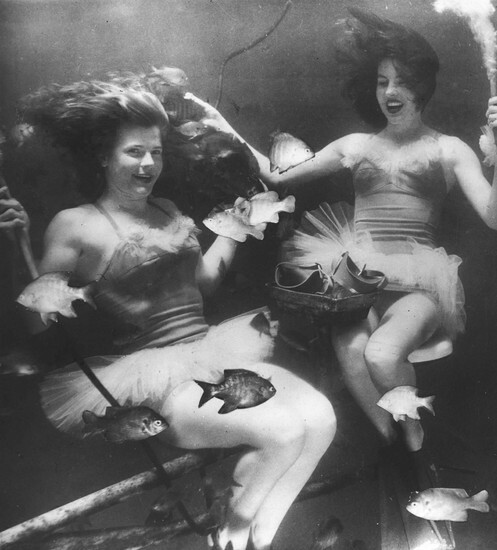 Mid-century aquamaids practicing ballet moves, left, and underwater table manners, right. The clowns, with names like Glurpo and Glurpette, would perform gimmicks like singing, smoking, and blowing perfect “smoke rings” or huge, ring-shaped bubbles from the lake bottom. In later years, the show focused on a Polynesian-themed tale of romance between a clown and an aquamaid, with a faux-volcano added to the above-water set in 1967. 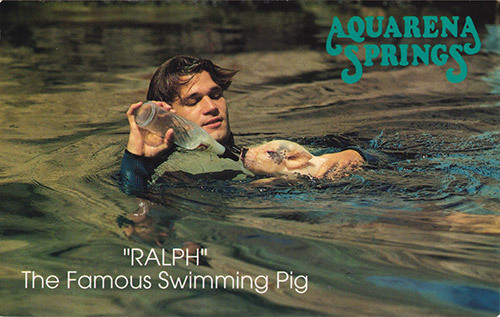 By the 1960s, the show also included “Ralph the Swimming Pig,” a piglet that was enticed to make his “swine dive” entry with a bottle of milk. A diagram of the theater featured in “Popular Mechanics” in 1952. Since the springs at Aquarena kept the water temperature from dipping dangerously low, swimmers had to perform every day except Christmas, no matter the weather. “One time a little, old man from Chile came to see the show, and it was winter,” says Sparks. “It was sleeting. It was 26 degrees, and this other girl and I, we kept putting it off, but finally the boss said, ‘You can’t do that any longer; that old guy has been here all day long!’ So we did a 5 o’clock show, and decided instead of 55 minutes, we’d give him an hour and a half. He could’ve died at that very moment. He has the sweetest, little, old, scrawny thing, and he didn’t have any idea what the announcer was saying because he couldn’t speak English. 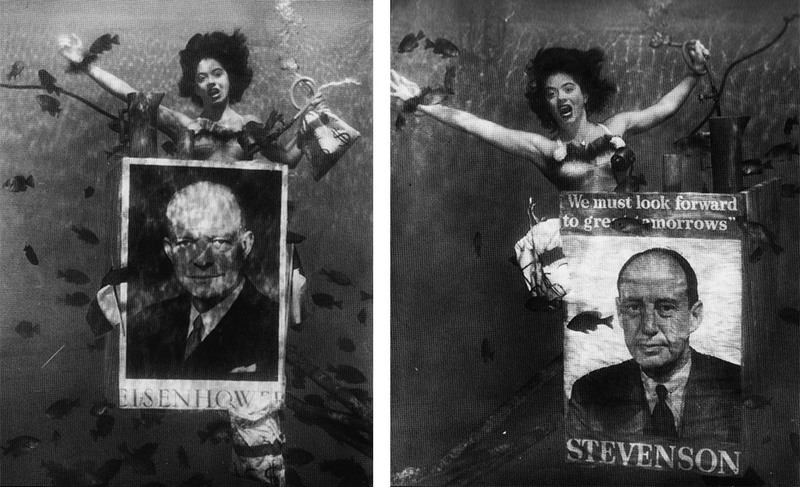 In 1952, Peggy Sparks was chosen to campaign underwater for both presidential candidates. Despite the odd work environment, the aquamaids had plenty of fun, playing practical jokes on each other and hamming it up for the audience. “My mother was terrified of water,” says Sparks, “but I talked her into coming down to San Marcos and being there at the show. Well, she sat on the front row, with my son and my little brother. And I said to the other girl swimming the show, ‘Let’s give them a real hip-hip-hooray thing. I’ll just take one sip and you hold the air hose, and I’ll act like I’m dropping to the bottom and struggling for air, and you’ll pretend that you’re not going to reach me in time.’ I’ll tell you what, I nearly lost a perfectly good mother. She was terrified, and ran out thinking that we were drowning. But you couldn’t have drowned us for anything. The submarine theater was featured on the front of “Popular Mechanics” in 1952. Though the offbeat attractions at Aquarena might seem podunk by modern standards, in the ’50s and ’60s, the park regularly garnered national media attention. 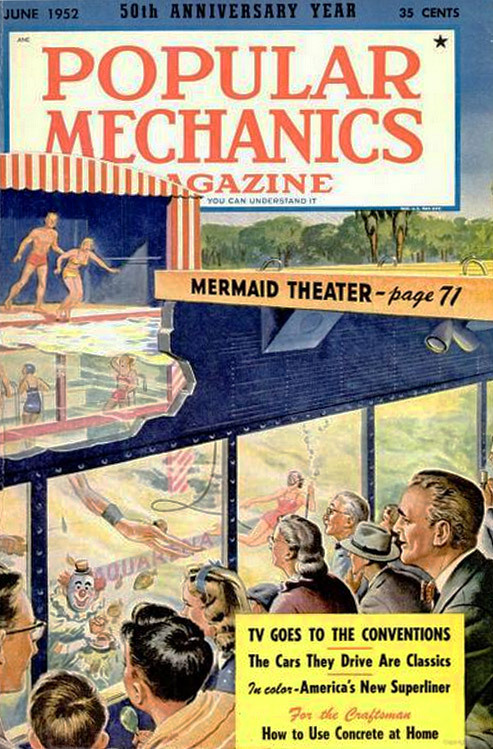 In 1952, the submersible theater made the cover of Popular Mechanics. That same year, Sparks starred in a series publicity stunts, posing as an underwater campaigner for presidential candidates Adlai Stevenson and Dwight D. Eisenhower. The bipartisan event was staged for the press, and its coverage nearly landed Sparks a national modeling contract, though she refused to sign. 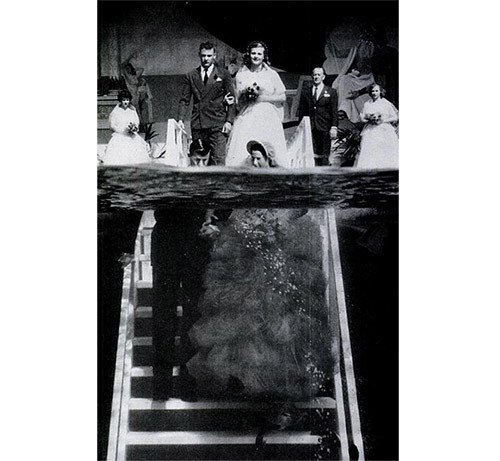 Two years later, in between Sparks’s tenure and Cregg’s mermaid days, aquamaid Mary Beth Sanger and underwater clown Bob Smith held their wedding on Aquarena’s underwater stage, and the event was captured for Life Magazine. Johnny Weissmuller, the famous swimmer known for his starring role in Tarzan films, visited in 1965 to film the underwater performance for his television series. 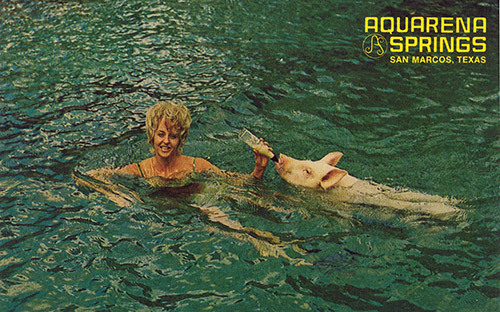 While Cregg was at Aquarena, the senior aquamaid, Barbara Backus, also trained the swimming pigs, and was featured on the television show “What’s My Line?” for her bizarre occupation. Such odd jobs weren’t limited to Aquarena’s performers, either. “We had one man, who wore a lead belt and actually vacuumed—it was an underwater vacuum—the show area to get rid of fish debris,” says Cregg. 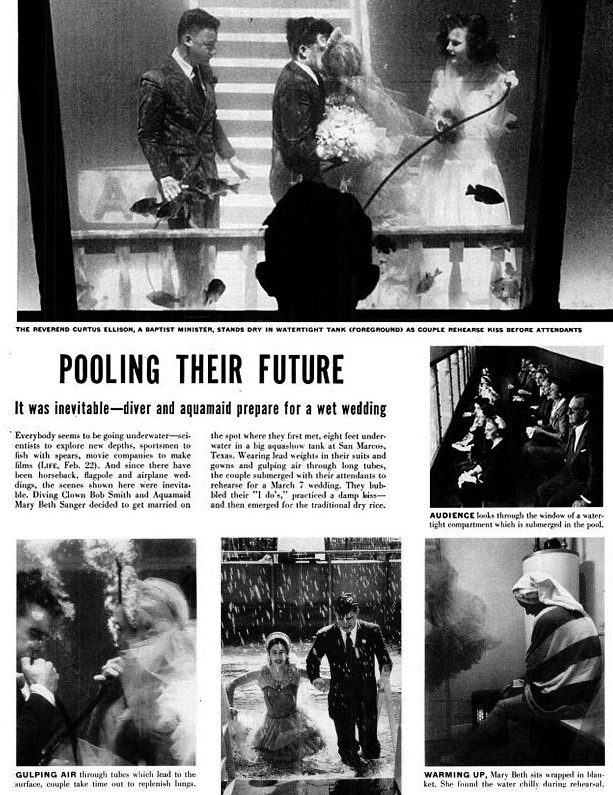 A spread from “Life” magazine in 1954 featured the underwater wedding at Aquarena Springs. In the end, it was the frigid water that derailed Sparks’s mermaid career, as health issues outweighed her love of performing. “I swam with double pneumonia for about two or three weeks,” says Sparks, “and finally I just had to give it up because I kept having to go the hospital.” Even while she was sick, Sparks kept swimming in the show nearly every day. “They’d take me in, give me a penicillin shot, and I’d go in the next show,” she says. The mermaid show continued long after Sparks and Cregg did their underwater ballets, captivating children and adults alike for more than 40 years. Even though Aquarena had lost a bit of its shine by the time I went in the late 1980s and early ’90s, visitors still loved its home-spun quality, this strange little oasis with a candle-making shop and a caged alligator pit. Yet eventually, competition from flashier amusements led to dwindling ticket sales, and even after the property was purchased by Texas State University in 1994, the park continued its decline. The university decided to restore Aquarena’s glass-bottom boats, but shuttered its less-educational attractions, converting the site into an environmental preservation and research center. In 2012, the submarine theater was finally removed from Spring Lake in an attempt to return the ecosystem to its natural state. A 1950s-era audience inside the submarine theater. An aerial view of the park, circa 1954. 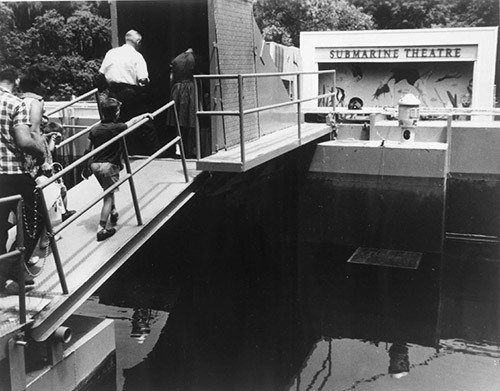 Visitors entering the original submarine theater. 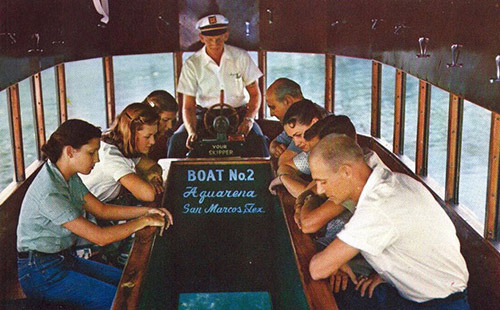 Inside a glass-bottom boat, circa 1950. Margaret Russell, left, and Shirley Rogers, Paul Rogers's daughter, perform at Aquarena in the 1950s. 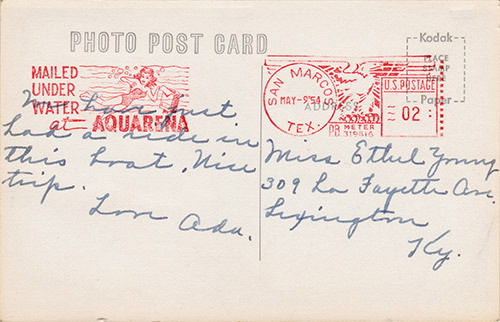 A postcard from the 1950s bearing Aquarena's unique postmark. An aquamaid in full ballet costume. Rehearsing for the underwater wedding in 1952. A close-up view of the underwater window in a glass-bottom boat. An aerial view of the renovated submarine theater and volcano set, circa 1980s. An aquamaid with a '60s hairdo teaching Ralph to swim. The boarding station for Aquarena's space-age Swiss Sky Ride. One of Aquarena's underwater clowns. The "volcano" and a performer dressed as a Polynesian native. My favorite article ever…..I actually cried during the video because it brought back so many vivid memories of Aquarena Springs…..then I laughed so many times reading about Sue Cregg’s accounts. There was no better place in the universe to experience and feed swans AND nutria on the weekends. Thank you Hunter for the best trip down memory lane. You’re the best! Aquamaid on the right in photo #7. We miss Aquarena but memories like these are priceless. Wow Hunter! That brought back memories from 50 years ago, going to see Aunt Sue and the beautiful underwater theatre. That was wonderful! I will share with many. Friend Doatsy shared with us. Wow Doni, great to hear – she’s the one with the banana? What was her name and when did she work at Aquarena? Thanks for the memories. Sue Cregg is my dear friend . She is still just as beautiful and talented as she was then. She is a wonderful writer and story teller. And most of all a wonderful Christian lady. I thought those women were divinities. I saw it in 1968, at 10 years of age. Anyone remember the piano-playing chicken? Thanks so much for this article. I’m 63 and still have vivid memories of visiting this water park for one day back in the late 50’s. Many, many thanks to everyone who worked there, you made this kid’s day! Thanks for the great article Hunter. 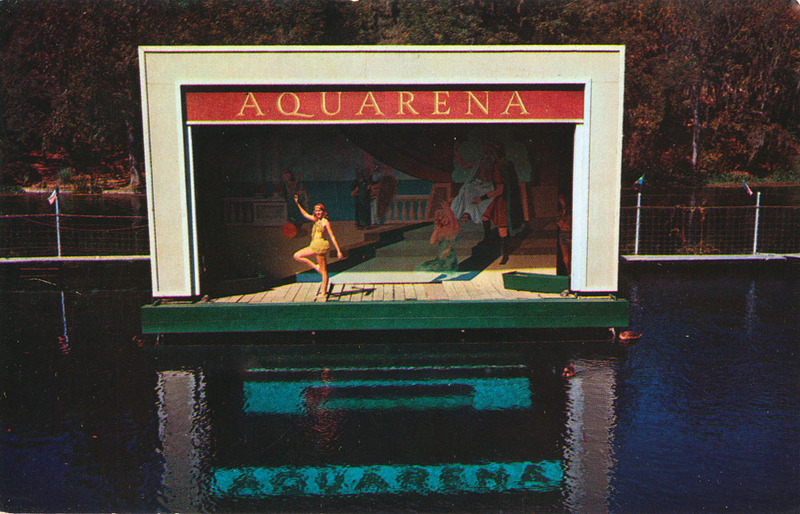 I worked at Aquarena from 1962 through 1972 and produced the Aquarena documentary, http://www.aquarenaandralph.com. It was a magical place and good to see other folks agree. I worked as the Public Relations Director at Aquarena from 1973 until 1978. I have so many wonderful memories of the attraction and the many people I had the privilege to work with. Gene Phillips was the best boss. I was right out of college, and he believed in me and my potential. Thanks all for the great comments, and for the links to the documentary and home-movie footage: The first clip on the texasarchive (above link) shows much of the show from the mermaid theater. Cheers! I worked there the mid-late 80’s while in highschool. Drove the boats, swam in the show, lots of fun. Those were the wonderful years. My aunt Mary Ortiz was the supervisor at the Gift Shop for many years. My sister Rachel was the supervisor at the Spring House in 1969. I met my husband Jesse Contreras working at Aquarena. He worked at the glass bottom boats and I worked at the Spring House in 1968. I also worked under Bertie Ware and after she retired I became the Accounting Manager under Jay Moore. Jesse and I were married on May 9 1970 while he was the supervisor for the glass bottom boats. On May 16, 1970 was the Great Flood od San Marcos. My Father-In-Law Joe Contreras was the Janitor at Aquarena. On that day of the flood he got stuck in the janitor’s closet. If it had not been for Scott McGehee my father in law would have drowned. Scoot McGehee and other employees were forced to go to the roof of the building, that’s when Scott relized that my father in law was still in the building. My father in law retired from Aquarena after working 30 years. We have great memories. My last day of employment was summer of 1987. I swam during the mid-70s. By that time, the girls were called mermaids and we wore the tail during picnic. It was a good job — helped me pay tuition for two years of Bachelor’s and then Master’s. I enjoyed my years swimming. Wish I’d been able to keep up with some of the other mermaids from my time there. No, not the one with the banana. The one on the right if you click on #7 in the photo catalog–picture taken in the 1950s. She is Shirley Rogers (daughter of Paul, granddaughter of A.B.). The Aquamaid on the left is Margaret Russell. Mom swam in the early 50s. She was a student at (then) Texas State Teachers College, and they would come get her out of class to do a show if needed. Thanks for the update Doni! I’ll get their info into the caption. I have 3 postcards of these, they all say Florida. So I guess they may have been issued with that to sell the postcards in Florida. Dang! I’ve never been and it made me cry. Almost! Sounds like a fun place though. Funny as it seems, I think I know now where Astroworld themepark in Houston got its ideas from. They too had the Aquarena. Mermaids it had none, but replaced with amazing ski shows by professionals doing tricks and stunts. 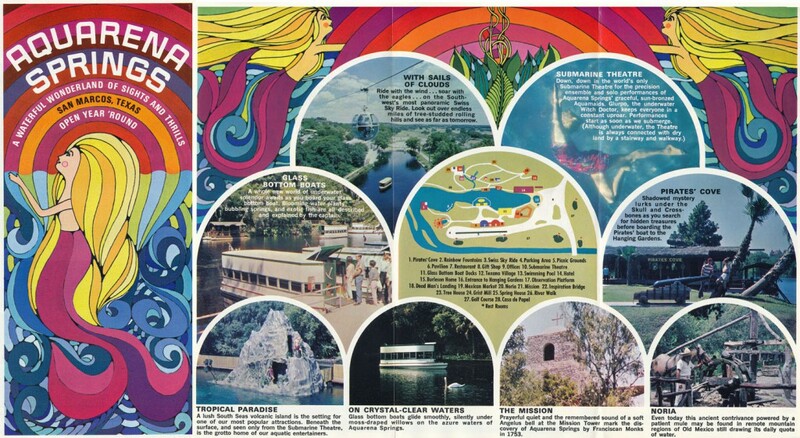 In another area featured theme park rides and some of these were a yellow submarine with glass bottoms and windows to view from. I don’t remember what all you could see on that ride. I was really little probably 7-9yrs old. The theme park also embraced the needle and the sky rides, but never any trained pigs, chickens or other animals. Rollercoasters, games, train, gift shop, kiddie park, petting zoo etc were there as well, but after seeing the different videos on here and youtube, im convinced Astroworld mimicked part of Aquarena. 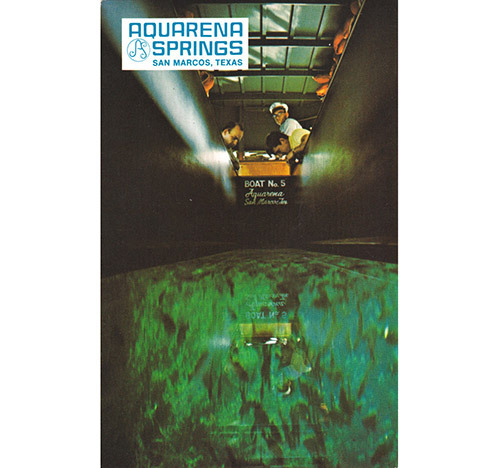 I’m going to ask a friend of mine who grew up in San Marcos and most likely has visited Aquarena of San Marcos. I bet she has fond memories and maybe a story or two. What a fantastic article!! I especially liked reading about the early days. I worked full time as a backstage “mom,” trainer, and performer (Aquamaid) from Spring 1984 to Spring 1989. Went back once, years after the show closed. Spring Lake was still beautiful, and I’m glad the springs are being taken care of, but it was like a friend had died. It gave me nightmares. I’m lucky that my parents took a video of the whole show and I was able to put it on DVD. I made copies for family so it still can come alive for us. I hope to get it on my FB page. Thanks again for more wonderful memories. This was a great article. I, too, swam at the Aquarena, in the late 1950s. My dad, Bush Ewing, managed the glass bottom boats; my mom, Mary Elois Ewing, sewed the decorations onto the swim suits; my brothers, Andy and Buddy Ewing, worked at the restaurant and Buddy was even a ‘bumper-sticker’ boy who helped train a “Ralph the pig.” But, we had been raised so near the river we were used to the constant 72-degree water, and none of us ever experienced the chill mentioned here. In fact, it was great when the snow fell and we could see the flakes hitting the water surface from underneath. One of the happiest times in my life, never since replicated, were at the Aquarena and the San Marcos River. What a great non-fiction tale to have shared with so many of us with memories of Aquarena. My children were quite young when we went as a family. I’m not sure which of us had more fun, but I do remember I had fears that the kids would fall in the water. Hunter, this was a great subject for you to have written the story. Keep up the great work. I’m delighted to read this piece of history that is close to so many of us. My twin sister, Julie, swam as a mermaid in the ’80’s. They swam all year round and helped feed the baby pigs. I was fortunate enough to go to Aquarena Springs back in 1982. What wonderful memories I have of that day. Sad that it is gone. I am trying to locate former mermaids that performed at Aquarena Springs. San Marcos will now be home to a new citywide celebration titled, “Mermaid Week SMTX.” This is slated for September 2016. We are searching for any former performers to be a part of the Royal Court. You may contact me at mermaidsmtx@yahoo.com. I worked as a aquamaid from 1969-1974. I live in San Marcos and have a dear friend that was also a aquamaid that lives in Buda and teaches at Texas State. We are both interested in learning more about Mermaid Week. Thanks for the memories! I was a mermaid in the 90’s and my husband was Glass Bottom Boat Guide. In fact, that’s how we met. He saw me walking the grounds, heard I was a mermaid, and quickly switched jobs. On his very first day, he was assigned to give me my oxygen. During the ballet sequence when he was supposed to hand me the hose, he got busy looking at at a fresh water prawn and forgot. I had to swim over to him and grab it and started hyperventilating a bit. But I finished the sequence and we met up on the first stage of the volcano. He apologized repeatedly and introduced himself. I told him it was ok, it was his first day on the job, and that my name was Cari. That was nearly 30 years ago and he . . . Wait for it . . . Still takes my breath away!! ? When I left there someone told me I’d always have dreams of that place. And I still do. Doing my mermaid thing in the tranquil waters of the underwater theater area, where there was no concept of time. Just peace and quiet, amazed by the other life we lost ourselves in when exploring that arena and its inhabitants. Best job ever for the both of us. Where else can you get paid to get a tan in between shows. Thank you so much for sharing. We just celebrated 22 years together on June 4th. The same day our 18 year old graduated from High School! ? Nice article!painting a mermaid mural on Texas state campus.im dedicating it to Shirley Rogers.my boss at accent lighting.should be done mid July 2016,agriculture water collection tank. Be still my heart! I am thrilled to learn about the Mermaid Festival 2016. I was saddened to learn that the park closed, but relieved my alma mater was involved with conserving it in a responsible way. Working here made my college experience extremely special. I’ve made lifetime friendships that I cherish 35+ years later. I created a FB in an effort to reunite mermaid alumni from tears past. I’d love to get involved with the efforts! Thank you for providing this forum! I love this article. I worked as a mermaid from 1985-1988 and it is still one of my fondest memories and still my favorite job. It never fails to bring a smile to someone’s face when you tell them you were once a mermaid. I was one of the aquamaids from 1961 to 1963 while I was a student at SWT. I was a mermaid in 1976 and some of 1977. I completely forgotten about my experiences of being a mermaid. I don’t why because it was so cool! I lived by the tennis courts and would walk to work and take the sky tram over. The nice lady who taught me was named Jenny Riley,I do believe so. “ ” Christmas was as much a holiday as a holy day.